Another article sent in from www.nurturing-nature.co.uk - thank you George. Rootrainers I wholeheartedly recommend. It’s not often that I would recommend a product or sing its praises. Every now and then though, a product comes onto the market that I buy and try. Many are, to be quite frank, rubbish. Rootrainers are different. 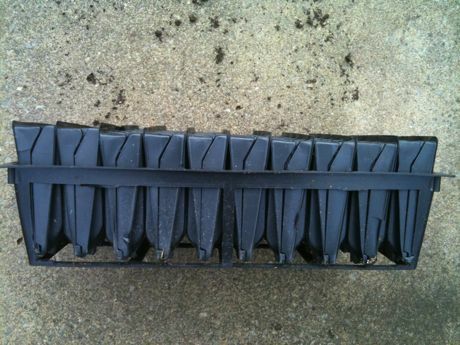 Designed by a Canadian professional engineer, Henry Spencer, in which to plant forest tree seedlings - it is obvious that he knew what he was doing and what was needed to achieve a genuinely first rate product. Rootrainers have been designed to open and close like a book. Each book contains 4 or 5 cells and each cell grows one plant or tree. The hinged book allows for easy root inspection, moisture checks and seedling removal. The closed books fit snugly together and several can sit side by side inside a clever little tray which holds them securely. 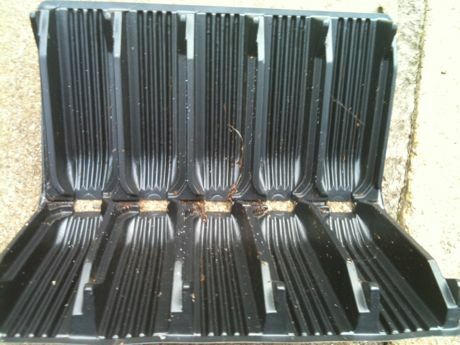 Each cell contains vertical ridges which encourage roots not to spiral, and to form a good fibrous downward growing root system, whilst protected in the rootrainer prior to planting out. Upon reaching the aeration hole at the bottom, they are ‘air pruned’ which basically means that the roots stop growing downwards when they meet air, thereby encouraging more lateral roots inside the cell. If they were not air pruned, they would continue growing downward and along the bench, floor or wherever they were being grown. This would make it very difficult to remove from the cell. Initially, they are expensive (as many patented products are) and a bit fiddly to clean. However, when you consider that I have had some rootrainers for 6 years, then the price pales in significance. They are so versatile, from acorns to peas, runner beans to onions all of which can be successfully grown in rootrainers. They do represent excellent value for money. Several sized cells can be purchased to cater for different plants, trees etc. This entry was posted in Sarah & Guests and tagged Compact Rapid Rootrainers, Deep (Sherwood) Rootrainers, Low Maintenance Deep (Sherwood) Rootrainers, Low Maintenance Rapid (Shrub) Rootrainers, Low Maintenance Slim (Rannoch) Rootrainers on 23rd November, 2010 by Haxnicks.